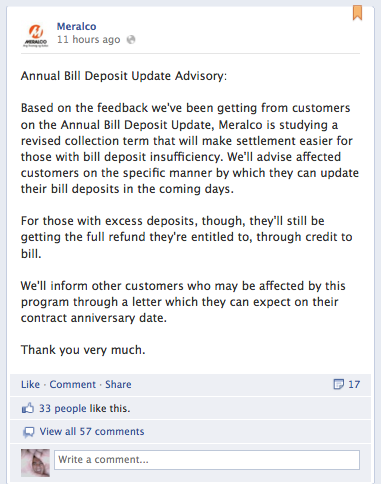 Is Meralco getting nervous (or more nervous?) with this recent Facebook post they published early in the afternoon of 11th October? It seems the protest to this Billing Deposit is mounting and I’m sure glad they are doing something about it and FAST. If only Meralco knows the power of SHOES then I think they wouldn’t be getting more flak than they should. Putting their feet in our shoes. I believe, for the most part, smart consumers know that planning is always key in any budgetary concerns of every day life. If only Meralco told consumers in advance what they have to prepare then we won’t have this big wall of NO from customers who are seeking either seeking a reprieve or a strike down from what consumers think is an excessive (albeit) demand for more fees. Consumers had enough of this unwanted surprises from bureaucrats and policy makers – whether in the political stage or in the commercial-consumer stage especially when people are already planning for reunions during Christmas. People are already winding down and want to appreciate their earnings. By doing it unannounced, what Meralco executives are telling consumers that asking for Billing Deposit in the last quarter of the year wouldn’t hurt their customers too much thinkg bonuses will be coming up later in the year anyway but that’s not the case here. In all intents and purposes, Meralco deliberately withheld communication and let the winds take its course – never letting their customers plan ahead. Meralco, if you were in my shoes? Would you agree in the manner this Billing Deposit played out? Would you do this just like this? Demand payment as if electricity is the only commodity we have to deal with every month? Like we don’t have mouths to feed? Could you have at least informed us of such potential payments we have to deal with? If only Meralco knows how to be HUMAN then I think they will have the support of a lot of people, a lot of consumers in paying Billing Deposits – and yes – even on a Christmas season and against our budget. More information: Know more what Billing Deposit is here and what it can do to condo unit owners.